Hello friends! It's pretty late in the day, in fact... the day is almost over, but I wanted to get this post in. This is my first 6x6 recipe submission for the Recipe Challenge Blog. Christmas in July was our theme for the week, and I felt compelled to share this recipe for Fudge Buttons. These yummy little treats are a favorite of the family at Christmas time (or any time for that matter), and they are without a doubt the easiest candy I've EVER made. I love that I can whip a batch up with ingredients that are almost always readily available in my kitchen. Yum, yum, yummy!! The Basic Grey 6x6 paper pad that I had on hand worked perfectly with the chocolate chip card stock. You can find a variety of other Basic Grey 6x6 paper pads at the Scrapbook Store At Your Door, along with coordinating buttons and glazed brads. Beeeeaaaaauuuuutiful!!!!! I chose to distress the edges of the papers with Tim Holtz Distress Ink in Vintage Photo(also available at the Scrapbook Store At Your Door). If you haven't tried this ink, you SHOULD!! It is a must have for anyone who loves that shabby/primitave look. I hope you had a wonderful weekend! Is the summer flying by, or is it just me? Thank you for stopping by today. 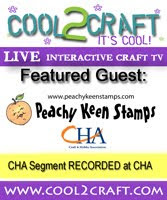 Tomorrow is Peachy Keen Challenge day, and I have a cool slice of summer to share with you!! May God bless and keep you today and always! Lorie! This recipe card just shows, in one go, why you are on the DT!! What a beautiful page! I absolutely love your antique-looking style. You make it look so GOOD! OK, the recipe looks amazing, too -- and simple! I only have one question. Is it a half-teaspoon of cocoa powder or one and a half? Lorie, Can I have this page for my recipe album? This is so beautiful! I am going to try your recipe also, they look yummy! OMG! This is gorgeous! I love the primitive feel with the pine punch outs and those buttons are just yummy! Awesome recipe card, Lorie!